NEWARK, Jul 12 2011 – Construction of ENJOY: A Generation House, the U.S. Department of Energy Solar Decathlon 2011 entry from Team New Jersey, a collaborative effort of Rutgers, The State University of New Jersey and New Jersey Institute of Technology (NJIT), begins July 11, 2011 following a ground-breaking at NJIT. Once construction of the house is complete, Team NJ will hold an official topping-off event at NJIT with major sponsors and VIP guests. Work will continue at NJIT throughout the summer with the students performing tests to ensure all systems work properly. In September, the house will be de-constructed, loaded onto trucks, and shipped to the competition site on the National Mall in Washington, D.C. Upon arrival, the team will aim for a two-day reconstruction timeline before adding finishing touches. Once completed, the ENJOY House will be ready to accommodate the thousands of visitors who will be touring the house during public display hours from Sept. 23-Oct. 2, 2011. 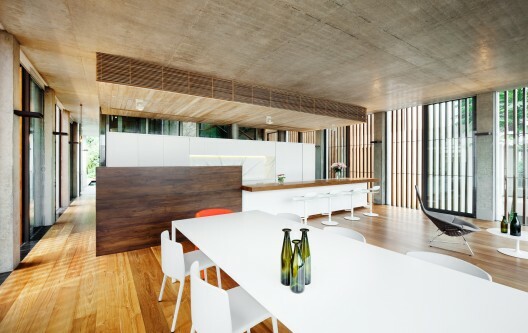 The ENJOY House is designed around a central core containing integrated systems. It is the first house in the competition’s history to use precast concrete panels as the primary construction material. ENJOY, a beach-inspired house, will feature an inverted-hip roof design for rainwater collection to support irrigation and grey water systems, an 8.2kW photovoltaic system that will allow the house to be completely powered by the sun, and the application of universal design principles, which will allow the house to be accessible to people of all ages and levels of mobility. An interdisciplinary project, Team NJ is composed of architecture and industrial design students from NJIT’s College of Architecture and Design and engineering, landscape architecture, planning, and computer science students from Rutgers University. Students regularly attend meetings with professionals in the field and take classes that focus on specific aspects of the design, such as a class on green building at Rutgers University, the NJIT Solar Design Studio and System’s Interface Studio, along with several classes offered in the landscape architecture school and engineering school. When one thinks of building an eco-friendly home, Jersey City might not immediately come to mind as a place to do it. With nearly a quarter-million residents packed into a dense 15 square miles, all things green there would seem to be at a premium. But architects and Jersey City residents Richard Garber and Nicole Robertson of GRO Architects in New York rose to the challenge of designing and overseeing the construction of a single-family house that’s a true testament to both innovative design and eco-friendly technology. Garber, also an assistant professor at New Jersey Institute of Technology’s College of Architecture and Design in Newark, was commissioned in 2007 by Denis Carpenter to design a concrete home with a fixed budget of $250,000. Click here for the rest of the article. And also check out this story as well. This image was taken in Fall 2008. There is something special in the blue hue of the Portuguese sky, especially in the crisp Autumn months. I am fascinated by the texture of the poured in concrete structure superimposed on the silent and still blue sky. The geometrical patterns created by the balconies adds a soothing rhythm to the urban fabric in Aveiro. 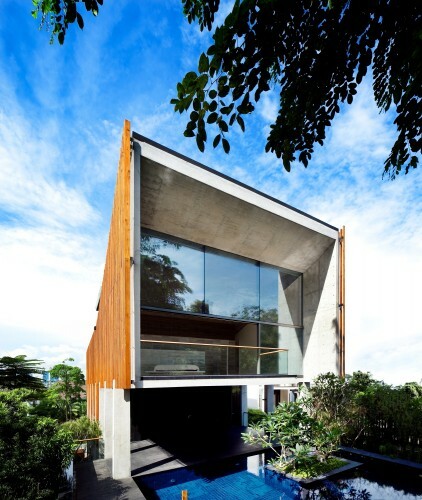 The raw concrete reflects subtle colors from the world around it, like an unpolished mirror. I hope you like this photograph as much as I do. The types of building materials you use on your home can greatly affect the sustainability and design for years to come. Here are some high-quality, green building materials to look into for your home. Having high-quality roofing shingles on your house is important to help your home stay protected longer. There are many sustainable materials on the market for roofing shingles that you should consider for your home. One type of sustainable roofing shingles is made up of solar reflective granules with a type of polymer modified asphalt, making your roof tough and long-lasting against the effects of harsh weather. This type of material reflects solar rays that may enter your home and heat up your house which raise your electric bill for A/C. By reflecting the solar rays, the color of your roofing shingles also lasts longer, maintaining the beauty of your home for many years. The asphalt is strong enough to keep your roofing shingles in perfect condition even during storms with high winds and high volumes of rain. This type of product will have warranties on the roofing shingles, ensuring that they will last for usually at least 12 years and in up to 110 mph wind. Investing in high-quality roofing shingles is something that you are sure to benefit from. When it comes to the exterior of your home, fiber cement siding is a great alternative compared to more traditional materials like vinyl and wood. This type of siding will ensure the sustainability of your home for longer, often with a warranty of up to 50 years. With great protection against the harsh elements of the weather, fiber cement siding does not warp or fade as quickly as other materials, keeping the design of your home looking its best. This material comes in a variety of textures so you can customize your home with whatever color and finishing look that your desire. Fiber cement siding protects your home from water, frost, and cold weather, keeping you warm and dry. Being a product that has the designation of National Green Building Standard, fiber cement siding is a building material to use when thinking about high-quality, green architecture. 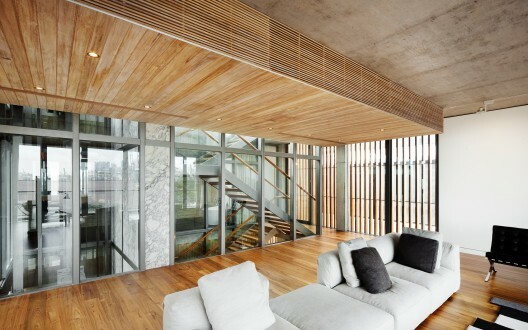 For the interior design of your home, consider using bamboo panels. 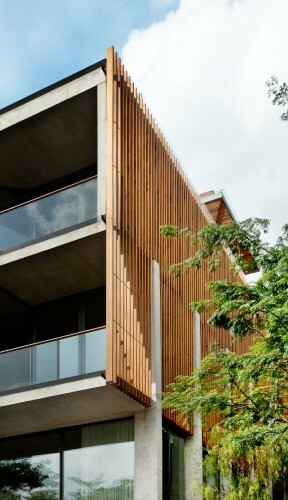 Made from bamboo grass, these panels are sustainable and support green architecture. 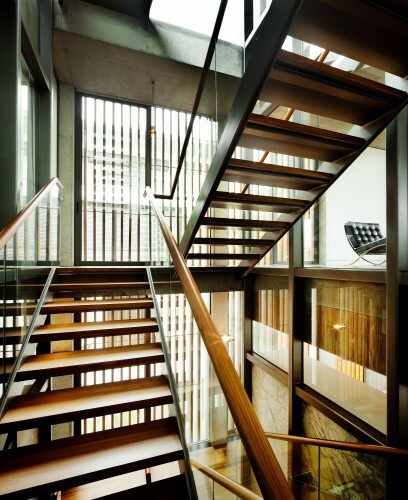 Bamboo panels can be used in many places of your home. From cabinets to tables, and even accent walls, bamboo is an innovative material that will also give your space a modern feel. Great for designing, this material comes in a variety of designs and textures including chocolate bamboo, natural bamboo, carbonized bamboo, and bamboo veneer. Bamboo panels are very strong and dense, long lasting and may qualify you for eco-friendly construction credits. Insulated concrete blocks are a great material to consider that often outperforms other building materials for the exterior of your home. This type of material is installed as one continuous system with no breaks in the wall, ensuring complete protection of your house from bugs and elements of the weather. Insulated concrete blocks keep your house warmer in cold weather and can greatly reduce your heating bill, which is also good for the environment. The core is made up of concrete, making this wall material durable and strong. These concrete blocks are easier and safer to install than other materials, taking out some of the risk of constructing the exterior of your home. With this type of material, you can also design the exterior and interior walls however you would like as insulated concrete blocks come in a variety of finishes. These eco-friendly materials can have a large effect on the sustainability and design of your home. They can increase the lifespan of your home, saving you time and money and the long run. These materials also come in a variety of designs so you can build and design your home how you want, making it the beautiful place to live that you imagined. My Role: Project Manager – Involved in the project from concept design through construction. The new “Center for Environmental & Life Sciences” (CELS) project will include construction of 107,500 gross square feet of new academic and research space and associated site development on the site of McEachern Hall, located along the eastern ridgeline of MSU’s upper campus. The Architect for this project is S/L/A/M Architects & Engineers P.C. The building was designed to achieve LEED Silver Enhanced Commissioning Certification based on the latest version of LEED New Construction. Enhanced Commissioning is one of the LEED points to be achieved. The new CELS facility is a four-story Spanish-Mission style building (with a mechanical penthouse) with a gross area of 107,500 SF with roughly 58,000 SF of teaching laboratories, research laboratories, classrooms and office space. The building superstructure is comprised of steel framing on concrete footings and foundations. The exterior finishes include the University’s signature white stucco and clay tile roof. A 2-Story atrium consists of three over-sized arched windows opens to a new patio facing the east-ridge with views of New York City. There is an East-facing green roof located on the third level. Office: departmental hub, private offices for all FT faculty offices, open offices for graduate students, adjuncts, visiting professors and technical staff. Instructional: departmental and CSAM assigned teaching labs, classrooms and support (i.e. prep / storage). Research: shared and dedicated research space, including both traditional “wet” and dry labs, to support computational and equipment-intensive activities. Other: includes common spaces such as multipurpose rooms, lobbies, lounges and support. Create a new identity for the Sciences thru the building and landscape design (Formation of a Science Quad). Consolidate the Sciences and promote better adjacencies. Utilize program density to create a building with activity and a sense of place for the sciences. Design the building to compliment the campus context with the Quad to the west and the distant views to the east. Reinforce with campus mission-style architecture. Design to LEED certification level of Silver. Design to accommodate trans-disciplinary research thru flexible/adaptable lab configurations. Plan to allow for future expansion of the Sciences with a possible connection to the existing buildings. 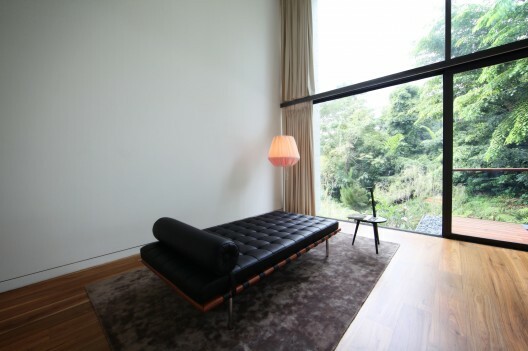 Content/Article/Photo Source: “Sentosa House / Nicholas Burns” 04 Dec 2012. ArchDaily. A series of open spaces clustered against the core. The core provides, structure, vertical circulation, services and adjacent has all baths and the kitchen maximising efficiency. Adaptable space, these open spaces and freed from pre determined function, the structure is designed to allow reconfiguration to future needs, walls can be erected where required. Materials are chosen for their inherent qualities. 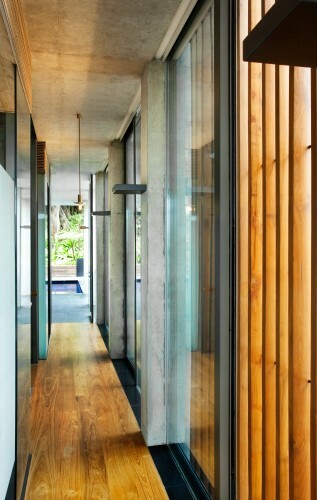 Recycled golden teak, fair faced concrete, stone and steel all offer duality of function. Their richness and texture provides the decorative element. Structure, the bones of the house are on display creating clear open space with a sense of seamlessness interconnecting with the gardens and landscape, framing views. The structural grid provides a logic, an order with which every element and detail diminishing in scale relates to and relies on. Detail, details are painstakingly distilled and resolved, nothing is left undone. The intention is the create an ease, a wholeness, a stillness…a sense of timelessness…. Experience, the journey through the house is one of wholeness with distinct parts offering a layered and complex series of experiences. Enclosure and compression expands to openness, the contrasts emphasis the feeling of space. Views are framed, and vary in scale, sometimes intimate and close into a court, other times expanding into borrowed landscape of the jungle and out to distant vistas. Environment, the house is designed for the tropical climate. The recycled teak screen and desk fits over the concrete structure and glazing protecting it from the sun allowing the thermal mass of the concrete to stabilise the internal temperature. 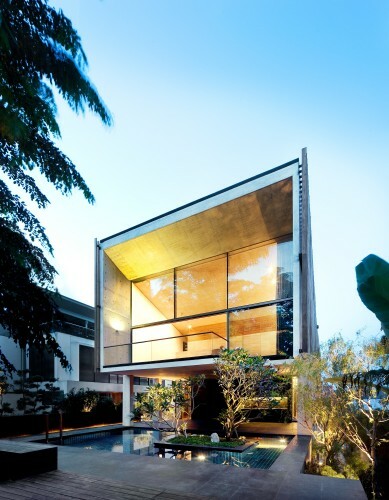 Cross ventilation, the other critical element of tropical design is maximises, the glass openness allowing even slight breezes to freely flow throughout he house creating a level of comfort. On the mechanical side, the climate control is the energy efficient aided by double glazing. The hot water is heated using a heat pump, utilising the free heat form the air and then circulated so hot water is available at taps with wasting water. Materials are reduced, the structure is exposed. The structural design using flat slabs reduces concrete usage by 25%. All of the timber is recycled. All of the materials are chosen to minimise surface treatments and unnecessary materials. We would love to hear from you on what you think about this post. We sincerely appreciate all your comments.If you like this post please share it with friends. And feel free to contact us if you would like to discuss ideas for your next project! This week’s ILMA Architect of the Week is one of my favorite Architects of all, Frank Heyling Furness (November 12, 1839 – June 27, 1912), who was an American Architect of the Victorian era. He designed more than 600 buildings, most in the Philadelphia area, and is remembered for his eclectic, muscular, often idiosyncratically scaled buildings, and for his influence on the Chicago architect Louis Sullivan. Furness was also a Medal of Honor recipient for his bravery during the Civil War. Toward the end of his life, his bold style fell out of fashion, and many of his significant works were demolished in the 20th century. Among his most important surviving buildings are the University of Pennsylvania Library (now the Fisher Fine Arts Library), the Pennsylvania Academy of the Fine Arts, and the First Unitarian Church of Philadelphia, all in Philadelphia, Pennsylvania. Over his 45-year career, Furness designed more than 600 buildings, including banks, office buildings, churches, and synagogues. As chief architect of the Reading Railroad, he designed about 130 stations and industrial buildings. For the Pennsylvania Railroad, he designed the great Broad Street Station (demolished 1953) at Broad and Market Streets in Philadelphia, and, for the Baltimore & Ohio Railroad, the ingenious 24th Street Station (demolished 1963) alongside the Chestnut Street Bridge. He was one of the most highly paid architects of his era, and a founder of the Philadelphia Chapter of the American Institute of Architects. His residential buildings included numerous mansions in Philadelphia and its suburbs (especially the Main Line), as well as commissioned houses at the New Jersey seashore, Newport, Rhode Island, Bar Harbor, Maine, Washington, D.C., New York state, and Chicago, Illinois. Furness’s independence and modernist Victorian-Gothic style inspired 20th-century architects Louis Kahn and Robert Venturi. Living in Philadelphia and teaching at the University of Pennsylvania, they often visited Furness’s Pennsylvania Academy of the Fine Arts — built for the 1876 Centennial — and his University of Pennsylvania Library. The 2012 centennary of Furness’s death is being observed with exhibitions at the Philadelphia Museum of Art, the Pennsylvania Academy of the Fine Arts, the University of Pennsylvania, Drexel University, the Library Company of Philadelphia, the Athenaeum of Philadelphia, the Delaware Historical Society, the First Unitarian Church of Philadelphia, and elsewhere. On September 14, a Pennsylvania state historical marker was dedicated in front of Furness’s boyhood home at 1426 Pine Street, Philadelphia (now Peirce College Alumni Hall). Opposite the marker is Furness’s 1874-75 dormitory addition to the Pennsylvania Institute for the Deaf and Dumb, now the Furness Residence Hall of the University of the Arts. Eero Saarinen (August 20, 1910 – September 1, 1961) was a Finnish American Architect and industrial designer of the 20th century famous for varying his style according to the demands of the project: simple, sweeping, arching structural curves or machine-like rationalism. One of Saarinen’s earliest works to receive international acclaim is the Crow Island School in Winnetka, Illinois (1940). The first major work by Saarinen, in collaboration with his father, was the General Motors Technical Center in Warren, Michigan. It follows the rationalist design Miesian style: incorporating steel and glass, but with the added accent of panels in two shades of blue. The GM technical center was constructed in 1956, with Saarinen using models. These models allowed him to share his ideas with others, and gather input from other professionals. With the success of the scheme, Saarinen was then invited by other major American corporations to design their new headquarters: these included John Deere, IBM, and CBS. Despite their rationality, however, the interiors usually contained more dramatic sweeping staircases, as well as furniture designed by Saarinen, such as the Pedestal Series. In the 1950s he began to receive more commissions from American universities for campus designs and individual buildings; these include the Noyes dormitory at Vassar, as well as an ice rink, Ingalls Rink, and Ezra Stiles & Morse Colleges at Yale University. He served on the jury for the Sydney Opera House commission and was crucial in the selection of the now internationally known design by Jørn Utzon. A jury which did not include Saarinen had discarded Utzon’s design in the first round. Saarinen reviewed the discarded designs, recognized a quality in Utzon’s design which had eluded the rest of the jury and ultimately assured the commission of Utzon. Eero Saarinen and Associates was Saarinen’s architectural firm; he was the principal partner from 1950 until his death in 1961. The firm was initially known as “Saarinen, Swansen and Associates”, headed by Eliel Saarinen and Robert Swansen from the late 1930s until Eliel’s death in 1950. The firm was located in Bloomfield Hills, Michigan until 1961 when the practice was moved to Hamden, Connecticut. Under Eero Saarinen, the firm carried out many of its most important works, including the Jefferson National Expansion Memorial (Gateway Arch) in St. Louis, Missouri, the Miller House in Columbus, Indiana, the TWA Flight Center at John F. Kennedy International Airport that he worked on with Charles J. Parise, and the main terminal of Dulles International Airport near Washington, D.C.. Many of these projects use catenary curves in their structural designs. One of the best-known thin-shell concrete structures in America is the Kresge Auditorium (MIT), which was designed by Saarinen. Another thin-shell structure that he created is the Ingalls Rink (Yale University), which has suspension cables connected to a single concrete backbone and is nicknamed “the whale.” Undoubtedly, his most famous work is the TWA Flight Center, which represents the culmination of his previous designs and demonstrates his expressionism and the technical marvel in concrete shells. Harry Weese & Associates built constantly from 1948 to 2000 but never reached the high profile of contemporaries like I.M. Pei and Philip Johnson. Weese’s architecture is highly original and often stunning, but has not been elevated into the late-modern canon alongside the less prolific work of Louis Kahn or Paul Rudolph (unlike them, Weese never taught at Yale). Yet Weese’s hundreds of built projects, unrelenting urban boosterism, and deep commitment to public life and preservation made him arguably more influential than any of his contemporaries. Weese’s most poetic work includes a pair of churches built in the early 1960s: First Baptist of Columbus, Indiana, and St. Thomas in Neenah, Wisconsin. The latter is disappointingly undocumented in the book, save for a striking photograph that shows the church’s raw concrete and timber interior, as Weese described it, “Devoid of pomp, yet bold in belief; material luxuriousness, no; richness of space and light and sound, yes.” It seems to match the best work of Marcel Breuer, who at the same time was also building spare, dramatic beton-brut churches in the upper Midwest. And slightly later, the Seventeenth Church of Christ, Scientist, resolved the constraints of an awkward triangular site on Wacker Drive by turning the rear of its large auditorium into a travertine-clad curve that holds its own against the backdrop of the Loop’s most famous skyscrapers. The Architecture of Harry Weese: Chicago modernist: Places: Design Observer.